North West-based hotel, casino and convention resort, Mmabatho Palms last week received a facelift worth a whopping R8 million. 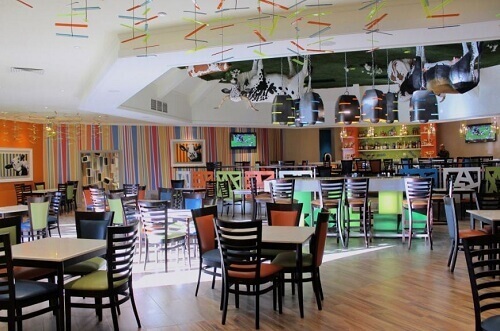 The upgrade includes the opening of the resort’s “all things cow” themed Moo Bar, renovations to the Leopard Conference Room and the Casino’ smoking area. The long-awaited Moo Bar has finally seen the light of day after the resort enticed its customers to ‘watch the space’ since they would be super delighted once it gets done. And honestly, it is “wow!”. ‘Moo’ on the bar’s title is actually the resonant vocal sound of a cow. And, that’s exactly the way the bar is themed. On a banner published by the casino resort before the renovations, there are artificial cattle and synthetic grass decorating the ceiling of the colourful bar. The venue surely will attract a lot of customers because of the big screens installed, the promised live entertainment and outdoor chilling on the patio. The Moo bar promises exciting events including happy hours, ladies nights and year-end gigs. The Leopard event room also got face-lifted, as well as the smoking area at the Mmabatho Palms Casino. The conference room now has new lights installed, new fancy carpets and a huge state-of-the-art projector screen. A list of changes have also been made to the casinos’ smoking room. These include new wall paints, smoke extractors and a brand new ceiling. The bathrooms at the Smoking Casino also got an upgrade. Mmabatho Palms is one of the largest entertainment properties owned by award-winning group, Peermont Hotels, Casinos and Resorts. The company owns 13 operations across South Africa, Botswana and Malawi. Mmabatho Palms Resort is situated in Mafikeng, in the North West province. The South African casino just turned 40 recently, making it one of SA’s oldest casinos.